Very few people wake up with hair perfect enough to simply brush and leave the house – and there are even fewer that can do it without looking like they’re nursing a hangover from a Wine Wednesday that got a little out of hand. For most of us, the struggle is real when it comes to taming and styling our locks. We go through a ton of hair styling products and tools looking for our haircare unicorn (i.e. that rare but perfect tool that suits our very unique and specific needs). NuMe, the same brand that brought us the very first clipless curling wand, has since created an entire line of hair products and accessories… many of which are unicorns. Their tools are designed with an unparalleled level of technical innovation as well as a keen eye for detail. They bring salon-level quality to an extensive line of products that includes curling wands, hair dryers, and NuMe straighteners. While there are many brands offering heat styling tools at a similar cost and aesthetic, they often use low-quality components and minimal ceramic coating on their plates. All NuMe straighteners and heated hair tools, on the other hand, feature 100% tourmaline and stone ceramic components. They implement high-end castings for the perfect balance between excellence and affordability. While we could go on about all the products this extensive line has to offer, we want to focus this straightener review on one of their best. With 1-inch plates and available in pink, turquoise, black, and even rose gold, this NuMe hair straightener looks as beautiful as it functions. On the more functional side, the Megastar NuMe flat iron is safe for all hair types and comes with: an indicator light so you never forget to turn it off, a digital display and temperature control so your heat setting is exact every time, and a fully rotating swivel power cord (among other ergonomic design features that make straightening your own hair as easy as they make it look at your salon). There’s not much about the Megastar that we don’t like. It’s soft and comfortable, easy to maneuver, and the heat range is impeccable. But we’ve narrowed it down to three specific benefits that make the Megastar one of the best NuMe hair straighteners: plate design, exclusive technology, and all-around versatility. 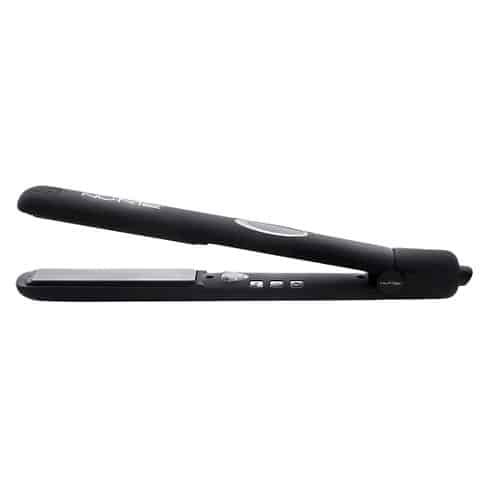 Many of the benefits that this straightener offers can be traced to one important feature: the plate design. The 1-inch ceramic plates are set with floating plate technology. But what exactly does that mean for you and your hair? The plates aren’t fixed within the flat iron. Instead, as you clamp the flat iron down, the small space between the plate and straightener allows the plate to bend and flex. In other words, they “float” in a way that’s flexible and adjustable, so you get just the right amount of pressure as you pass it along your hair. That means none of the tugging and pulling you often get from lower quality straighteners. But there’s actually even more to the plates that we loved. Particularly, their unusual – but most welcome – size. The Megastar plates are longer than the average hair straightener plate, so you can cover more of your hair at once and halve the amount of time you take to style and straighten. First, let’s talk about the integrated infrared heat strip technology that the Megastar uses to protect your hair as it styles it. As the term implies, the heat strip emits an infrared light beam to send gentle heat directly into your follicle and out through the cuticle, ensuring the healthiest possible styling. The second important piece of innovative technology that NuMe built into the Megastar is the negative ion conditioning technology. As negative ion wavelengths pass through your hair shaft, they seal the hair cuticle, lock in moisture, and support glossy locks. At the same time, your hair is injected with electrons, which help to tame frizz and static long after you’re done styling. Last but not least, the tourmaline ceramic itself deserves a mention. It’s this high-quality plate material that really sets the tone for the rest of the flat iron. Not only do they provide a friction-free surface that reduces tugging or pulling, they’re also natural conductors for infrared heat and negative ions – meaning that NuMe’s technology is two-fold in it’s approach to your hair health. The Megastar’s versatility stretches far beyond its ability to fit almost any budget, it’s also great for any hair type. From very curly to static-prone, the Megastar can tame your mane since it allows for a wide range of temperature settings to choose from. The temperature on this device ranges between 190 and 450 degrees. It can hit the highest heat in less than a minute (which is both impressive and handy when you’re in a rush). But, unique to NuMe straighteners, are the cool settings. These work great on fine and easily damaged hair. It’s worth mentioning that NuMe also has an awesome warranty that covers you in case of any malfunctions. And we put more trust in the brands that back up their products! Like all NuMe products, if your Megastar stops functioning within the first year, you’re covered under a one-year manufacturer’s warranty. The Megastar NuMe straightener is among the best NuMe hair straighteners available – and that’s saying something for a brand with more than 10+ straightening options alone. Whether you’re looking for straight or curly, the Megastar combines the highest-grade ceramic plates with the latest and greatest in heat tool technology for an incredibly versatile straightener that we love.